INULIN-NUTRIMED® reduces the gastrointestinal absorption of fats and their synthesis in the liver, increases the breakdown of triglycerides in the muscles. Furthermore, INULIN-NUTRIMED® lowers cholesterol levels by reducing its production in the body and increasing its intestinal excretion. 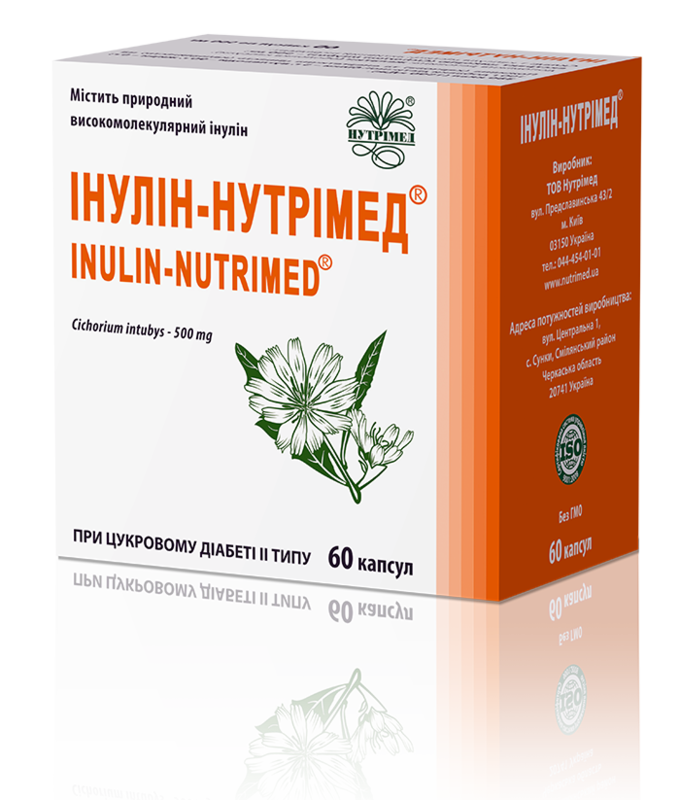 INULIN-NUTRIMED® suppresses appetite by reducing the level of the “hunger hormone” ghrelin, as well as by stimulating the secretion of peptide YY. Peptide YY stimulates the neurons responsible for the satiety and inhibits the neurons that stimulate appetite. NUTRITIONAL AND ENERGY VALUE (CALORIC VALUE) PER 100 g OF THE SUPPLEMENT: proteins – 5.0 g, carbohydrates – 90 g, fats – 0 g; 380 kcal (1590 kJ). RECOMMENDATIONS FOR USE: INULIN-NUTRIMED® is recommended for non-insulin-dependent diabetes mellitus (type II): it helps lower blood glucose levels and normalize carbohydrate and lipid metabolism, prevents vascular complications in diabetes mellitus (type I and type II), atherosclerosis and can be used to prevent the development of diabetes in individuals at risk (overweight, family history, etc). METHOD OF ADMINISTRATION AND RECOMMENDED DAILY DOSE: adults should take 2 capsules 3 times daily 15 minutes before meals swallowed with plenty of drinking water. CONTRAINDICATIONS: individual sensitivity to any ingredient. PHARMACEUTICAL FORM: capsules with the contents weight of 500 mg ± 5%.